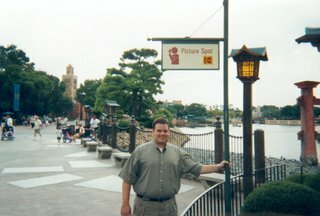 I don’t appreciate the Disney parks as much as I should. Didn’t make it there until I was 29 and by then I was looking at how the fake rock was sculpted and where the electronics were hidden. I’ve never had the opportunity to think it was real and that Mickey wasn’t actually just a 19 year old aspiring actor who was two years from finding out that he is gay. My favorite part about the parks are the Photo Spots. 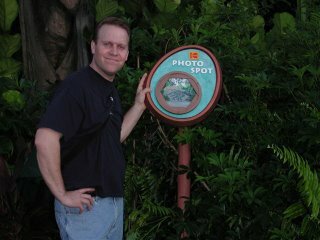 In case you are not smart enough to figure out that the huge Chinese gateway or the monolithic statue are a good place to snap a photo of Uncle Bob, Disney helps you out by posting a sign telling you that it is. Here’s a photo of Bill at Epcot and a photo of me at somewhere that is not Epcot.